A winter storm moved out of the tri-state area just before dawn Friday but commuters were urged to take caution on slippery roads coated by flakes overnight, Storm Team 4 said. 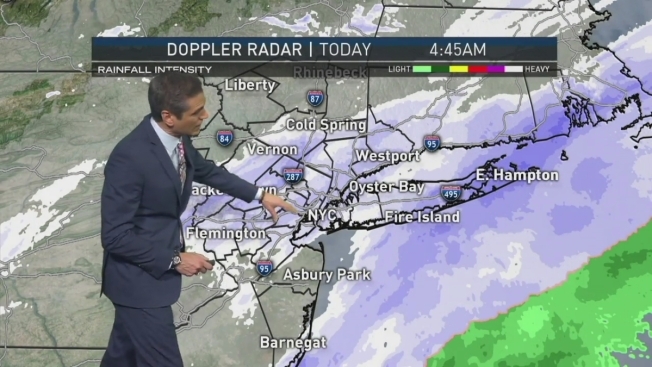 A few flurries remained Friday morning as the system passed over the eastern end of Long Island, which along with the coast of New Jersey, saw the worst of the storm. In New Jersey, about 2 inches of snow fell in Woodbridge and Port Reading, while East Brunswick saw 1.5 inches. Suffolk County also saw heavier snowfall and police said slick roads may have caused a serious accident in Wyandanch. Snow is in the forecast for much of the tri-state Thursday night. From Long Island to New Jersey, crews were ready to hit the road with salt and plows. Ray Villeda reports. Alternate side parking in the city was suspended Friday, the Department of Sanitation announced. Payment at parking meters will remain in effect. The snow comes with a shivering span of four days that will include below-freezing temps this weekend. The mercury barely hit the 30-degree mark in Central Park by early afternoon Thursday, though the wind made it feel like the 10s or 20s, and Storm Team 4 forecasts an increasingly frigid slate of temperatures on Friday. Snow is possible again this weekend, though the models currently project the storm system to stay offshore and away from the city, Storm Team 4 says. The Jersey Shore and Suffolk County may see a snowfall of 1 to 3 inches. Temperatures this weekend are expected to be bitterly cold, with highs capping out at 28 and 27 degrees Saturday and Sunday, respectively. The arctic chill sticks through the start of the next work week, with the mercury not expected to reach above freezing until Tuesday. On Wednesday, temperatures are forecast to soar into the low 50s, but the warm weather will bring clouds and showers, which could continue into Thursday, when highs reach the upper 40s.